What Apple says is the 'world's most popular camera' has got better with the launch of the iPhone 7 and iPhone 7 Plus, which boast 12 megapixels and optical image stabilisation, and in the case of the larger handset, an additional telephoto camera that will work with the primary one to offer better zoom and a new depth-of-field effect. Owners of the larger handset can sign up to Apple's iOS 10 public beta to test drive the Portrait Mode feature before its official release, which offers a bokeh effect similar to one offered by a DSLR where the background appears artfully blurred. And popular photo apps have got an update too to suit the new handsets. We've rounded up some of the best, from Instagram to Enlight. Adobe's Photoshop Lightroom for iPhone has been optimised for the new handset too and claims it 'enables you to craft and share professional-quality images from your smartphone or tablet.' Support has been added for the iPhone 7 Plus' dual lens camera and improved colour, lens and noise profiles have been added to suit the new phones. Users of Apple's new handsets can also use DNG - Adobe's new open-source RAW format that's claimed to give users 'maximum image quality and the greatest amount of editing flexibility.' Some of the features need to be paid for, including the original Local Adjustments feature that lets users apply Exposure, Brightness, Clarity, and other adjustments to a specific part of a photo. Instagram has around 500 million active users typically posting selfies and pictures of avocado on toast, but portraits and culinary creations are about to look more professional, thanks to the Beta rollout of the iPhone 7 Plus' Portrait Mode. In addition, Instagram will leverage the handset's dual camera to add optical zoom to Instagram Stories, while all its photo filters will be updated to take advantage of the iPhone 7's so-called wide color capture, which will make photos of flowers and well, avocados, even more vivid than before. Another new feature will be the ability to convert Live Photos into Boomerangs – short looping GIFs usually created on another Instagram app. Enlight, dubbed an 'all-in-one photo editor' is only available for Apple devices. But like Adobe Lightroom, the latest version of the app will support RAW photos. Apple says 'the extraordinary performance of the A10 chip allows the app to handle computationally expensive tasks with ease' and like other photo apps, Enlight will make use of the new iPhone's wide colour capture so users can enjoy vivid, natural colors. However, the app also offers other tricks. For example, it allows users to convert their photos into street art and realistic-looking sketches, as well as draw on top of them, overlay photos and create montages. This app may be a little more pricy than others, but it turns an iPhone into a high definition video camera with standard, manual and hybrid modes. It's been used for more high profile video projects than any other video app, from Apple ads and car viral videos to the Sundance hit film Tangerine. It will accommodate the iPhone 7 Plus' dual lens and will feature a 'lens bag' with 4 lenses, a variable speed zoom with a 3D Touch 'rocker', a selfie cam, and a fully manual wide angle and telephoto prime lens option. The newest version of the app will also offer stackable filters that can be rendered live. Apple fans who have an Apple Watch can use it as a remote control too. Obscura's USP that its users can use gestures such as the swipe of a thumb to control exposure and focus controls for 'effortless adjustments'. Updated for use with the iPhone 7 and iPhone 7 Plus and iOS 10, the app offers filtered, RAW and Live Photo capture but stops short in the newest version from supporting the iPhone 7 Plus' dual lens feature. The app also offers a variety of live filters enabling users to choose one before they take a shot, or apply them afterwards, depending on their preference. They include arty effects such as Selenium, which is 'a little bit unsettling and alien' and Toast for a warm sepia effect. ProCam 4 will tap into the iPhone 7 Plus' dual lens camera system to enable its users to make full resolution 3D photos called 'wigglegrams'. All they have to do is take a photo using the iSight Duo camera then align the two photos so they sit directly on top of one another. This creates a 3D effect that comes with a wiggle when saved as a GIF or video. Like other 'professional' photo apps Procam 4 will lets users save stills in JPEG or RAW formats and comes with an array of DSLR-esque settings as well as effects. 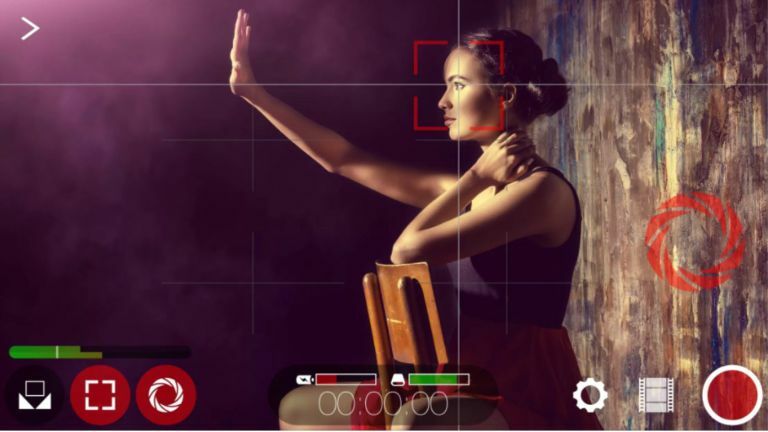 Reuk gives users control over their phone's exposure as if it were a DSLR so they can make shots look exactly like they want to. So, users can choose what they want to edit and swipe on the viewfinder to control the ISO, shutter speed, focus, white balance and flash. And using the iPhone 7 and iOS 10's new capabilities it now lets its users shoot in RAW so they have more flexibility when processing their photos. The latest update lets users choose between the wide angle or telephoto lens of the iPhone 7 Plus and automatically uses image stabilisation when available.